Director/Screenplay – Kim Jong-hwa, Based on the Webcomic by Joo Ho-min, Producers – Kim Yong-hwa & Won Dong-yeon, Photography – Kim Byung-seo, Music – Bang Jun-seok, Visual Effects – Dexter Digital & Goodbye Kansas Studios, Production Design – Lee Mok-won. Production Company – Realies Pictures/Dexter Studios. Firefighter Kim Ja-hong falls from a burning building while saving a young girl. He gets up to find three guardians waiting to guide him into the afterlife. There he learns that each soul must pass through seven tests over the course of 49 days during which judges decide whether the person is worthy to be allowed to reincarnate. Ja-hong is already regarded as a paragon because he died selflessly and if the three guardians can win his case it will add toward their own reincarnations. As the trial progresses, the prosecutors bring out the fact that Ja-hong is guilty of many sins, including lying to others, allowing a colleague to die and attempting to kill his mother. The three guardians argue that he acted selflessly on all occasions. Meanwhile, a vengeful spirit is causing havoc in Heaven. The guardian Gang-rim goes down to Earth to find the cause of this. There he investigates the suicide of Ja-hong’s brother Soo-hong shortly after the funeral and the suffering Ja-hong’s mute mother undergoes, all of which is endangering his chances for reincarnation. 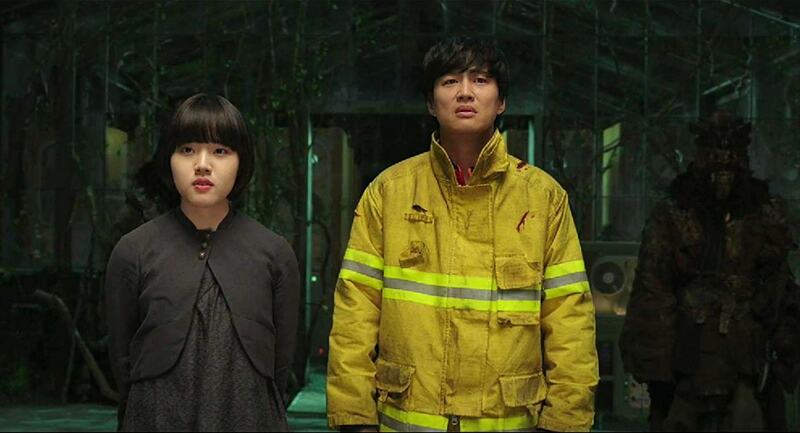 Along with the Gods: The Two Worlds was a massive hit in South Korea, apparently being the second most viewed Korean film ever. It was the fifth film of director Kim Jong-hwa who had made a string of commercial successes with the non-genre likes of Oh! Brothers (2003), 200 Pound Beauty (2006), Take Off (2009) and Mr Go (2013). It was based on a web-based comic-book that has been published since 2010. Kim Jong-hwa seeks to emulate the model of Western superheroics and in particular the type of fantastique works that Chinese cinema is perfecting these days – see works like League of Gods (2016) and The Monkey King (2014) and sequels – in creating a blend of CGI and live-action that becomes almost edible in its lushness. The film creates epic CGI landscapes – a pillar stretching above a sea of souls in lava; a court taking place on the edge of a waterfall; an icy canyon with walls containing the frozen souls of the condemned; the fall down into a vast pit of floating rocks – although these are not quite as technically polished as their Chinese counterparts. On the other hand, Along with the Gods: The Two Worlds has some huge problems. Part of this is that it is one type of film – an Eastern parable about the moral trials Cha Tae-hyun’s hero must undergo to earn his reincarnation – but Kim Jong-hwa keeps wanting to push it into being a superhero film. The story starts out something akin to Oxide Pang’s Who is Running (1997) in which the hero must undergo a series of trials – in other words a story based around a character’s choices as opposed to epic superheroics – but gets sidetracked. Of course, it may well have been that the straight moral redemption narrative was too clean and the hero so saintly sanctimonious in his actions as to be unbelievable – he dies as a firefighter while trying to save a child and was working selflessly to support his family, writes dozens of letters to the daughter of his dead colleague, is even seen saving cats from ledges on his day off – that Kim Jong-hwa sought to add something to make the story more interesting. However, Kim gets carried away. He keeps throwing in these wannabe superheroic scenes that have little point – like Ha Jung-woo down on the mortal plane flying across the city in pursuit of a ghostly entity that travels via electrical lines. Or scenes where Cha Tae-hyun and the guardians’ journey down a heavenly canal beset by demonic forces on all sides; their trying to make their way across an abyss aboard a gondola as the demonic forces cause it to collapse; battles with creatures made up of rocks and later sand. For no clear reason, the climax of the film involves a massive battle around a military base with a demonic entity that takes the form of a huge storm. You keep asking yourself what this has to do with the simplistic moral redemption tale that the film starts out being. Along With the Gods: The Last 49 Days (2018) was a sequel.